Cheating… it was once a private matter, but times have certainly changed. No longer is staying private about cheating a thing. Today, it’s all about going public with the indiscretions. For one woman, she had no care in the world to air her dirty laundry in public and on the Internet. In fact, she seemed to relish in the fact that she cheated on her husband with her own “first” cousin. Talk about no class! Hacked by your lovely wife, with a picture of the woman wearing nearly no clothing posted with it. 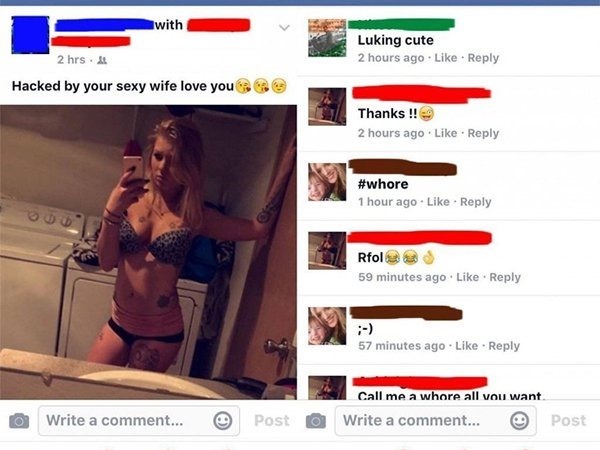 In response, the person writes back “Luking cute” and then calls her a whore. 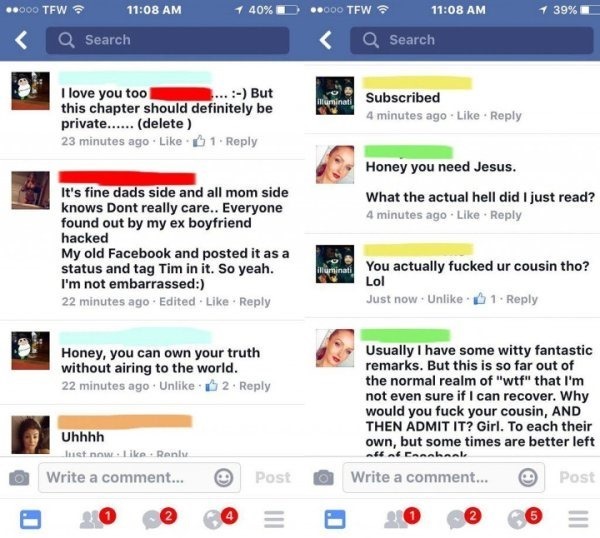 Thinking the whore was in response to the way she looked, the person replied that it was because she cheated on her husband with her first cousin. Then decided it was a good idea to post half-naked pictures of herself on the Internet. The writer said whore seemed fitting unless the husband is a liar and wants to hear the truth from her. They also wrote that the girl was dysfunctional. 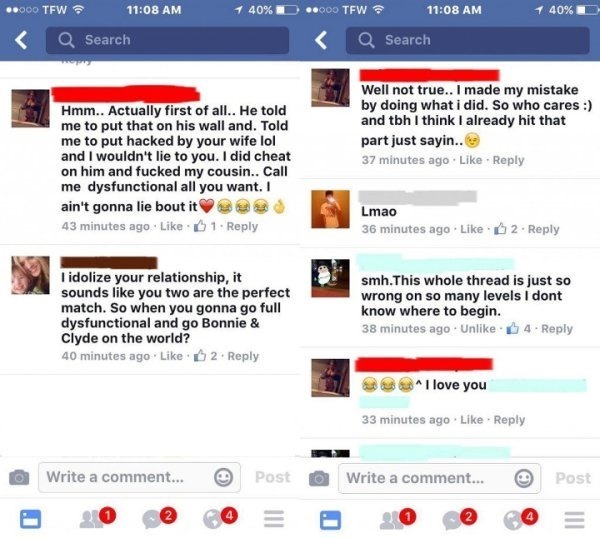 Without batting an eye, she wrote back saying yes, she cheated on her husband with her cousin and that being called dysfunctional was no big thing. She also said sleeping with her cousin was a mistake and doesn’t care anymore about it. The OP said the rest of the family knew and has dealt with the issue behind it. 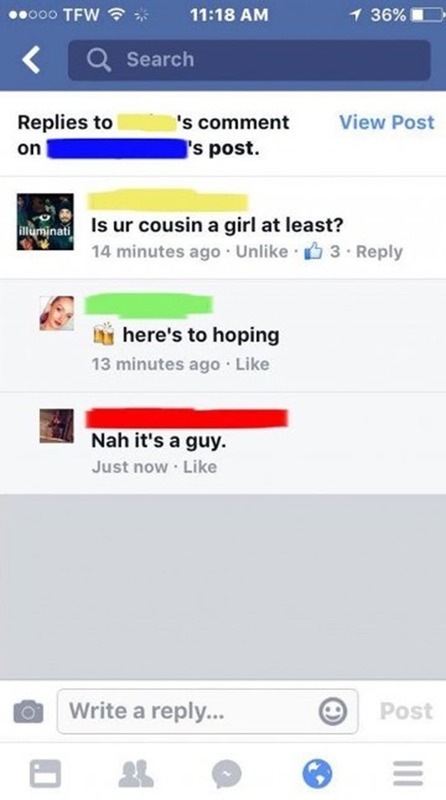 Many other commenters on the post were in disbelief about the girl’s cavalier, nonchalant attitude toward sleeping with her cousin more than they were about the acknowledgment of the cheating. Many of them said there were other ways to air dirty laundry than on Facebook.